The CSG is involved with the conservation and management of all 23 species of crocodilian around the world. The conservation status of one species may vary relative to other species, and may vary greatly within its own distribution. 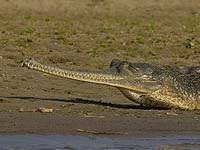 For example, populations of Saltwater Crocodiles (Crocodylus porosus) in Papua New Guinea, Australia and Indonesia (Papua Province) are large and secure, yet populations in other Range States (eg Bangladesh, Brunei, Cambodia, Malaysia, Myanmar, Palau, Philippines, Thailand, India) are small and perhaps under threat. In some countries the species is or is likely to be extinct (eg Singapore, Thailand). Likewise, the American Crocodile (C. acutus) is secure in Cuba and the USA, but populations have been greatly reduced in the other 15 Range States. Thus, actions by the CSG are prioritised, largely on the basis of the conservation status of particular species. By 2010, 7 species were considered to merit priority action, and major initiatives are being planned and/or are underway. However, the CSG and its members are working on most species in different countries to some degree, regardless of status, advancing our knowledge of crocodilian biology and furthering conservation and management initiatives. In 2002, the State Forestry Administration of the People’s Republic of China (SFA) issued the “China Action Plan for Conservation and Introduction of Chinese Alligator” in an attempt to ensure that the species does not become extinct in the wild. 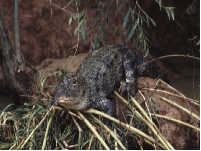 The plan addressed: monitoring and current status of the wild population; reintroduction programs; public education; scientific research; and, development of a master plan for the Anhui Nature Reserve for Chinese Alligator. It also calls for acquisition and rehabilitation of wetlands for re-establishment of wild populations. The re-introduction program has so far resulted in release of a total of 30 alligators into Hongxing Reservoir and Chongming wetlands (Jiangsu Province) and Gaojing Miao Farm (Anhui Province). Post-release monitoring of wild populations in Anhui Province obtained continuous breeding of the re-introduced alligators. Release of alligators into semi-wild habitats has been carried out in Changxing Breeding and Research Center (Zhejiang Province) to habituate captive-bred animals to wild conditions. 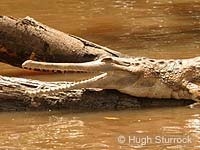 The plight of the Gharial (Gavialis gangeticus) has worsened in recent years, and the species was listed as “Critically Endangered” on the IUCN Red List of Threatened Species. The Gharial Conservation Alliance (GCA) is an international organization committed to reversing the decline of the Gharial through population management, habitat protection, and cooperation with local people and communities. The GCA is based in India, but consists of scientists, educationists, social scientists, fundraisers, and concerned individuals worldwide. Combining the diverse expertise of its members, the GCA is taking a holistic and comprehensive approach to conservation of this species and its habitats. The basis of all GCA activities is sound scientific knowledge of the Gharial, its riverine ecosystem, and consideration of the people living alongside the species. Recognizing the importance of involvement of local people in conservation and management programs, the GCA is taking an integrated ecological and sociological approach to the Gharial conservation crisis. 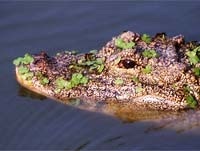 The Orinoco Crocodile (“Caiman del Orinoco” in Venezuela, “Caiman Llanero” in Colombia) occurs in the Orinoco River basin (surface area of 600,000 square km) of Colombia and Venezuela. Uncontrolled hunting for skins between 1930 and 1950 greatly reduced the wild populations. In Colombia, surveys undertaken in 1994-1997 indicated that the wild population was less than 250 individuals. A Conservation Plan developed by the Colombian Government included surveys, captive breeding and reintroduction, but there have been problems implementing the program. In Venezuela the situation for the species is much better. 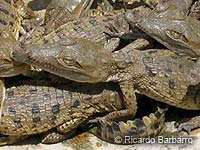 Here, a conservation program was developed by Government and the Venezuelan Crocodile Specialist Group (GECV; Grupo de Especialistas en Cocodrilos de Venezuela); the GECV comprises a diverse group of people interested in crocodilian conservation (eg universities, NGOs, Government, private ranches), and leads the conservation efforts. The program is based principally on restocking, which was initiated in 1990 and has resulted in 5575 Orinoco Crocodiles being released into wild habitats. Eggs are collected from the wild, artificially incubated, and the hatchlings raised to a larger size (>70 cm total length) before they are released back into the wild. Some hatchlings are also produced through captive breeding. There are now established wild populations in the Cojedes, Capanaparo and Sinaruco Rivers, and a “new” wild population has been created through restocking in the Caño Guaritico Wildlife Refuge in Apure State, where the species had been extirpated historically. Released animals have reached maturity and are now breeding. A considerable research effort has been a feature of the program, and the biology, ecology, reproduction, survival of released animals, movement and captive breeding have been studied. 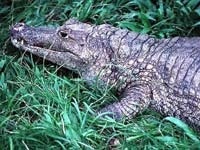 Although the species has not recovered completely, Venezuelan authorities are currently investigating new management options, including ranching, that can involve local people living in the same habitats as the Orinoco Crocodile, and create additional incentives for conservation of the species and its habitats. There is little doubt that the long-term future of the species is linked to the participation of local communities. The Philippine crocodile is listed as “Critically Endangered” on the IUCN Red List of Threatened Species, and the wild population has been estimated to consist of less than 100 adults. Although a captive breeding program has been successful, Philippine crocodiles and their habitats continue to be threatened, and no crocodiles have yet been reintroduced into totally wild habitats. In the municipality of San Mariano, Northern Luzon, the Mabuwaya Foundation has demonstrated that community-based in-situ conservation can be successful. Past initiatives include a “Forum on Crocodiles in the Philippines” (Manila, Jan-Feb 2007), in which more than 100 representatives of Government, industry, NGOs, Philippine universities and local communities participated. Central to the Forum’s agenda was the goal of improving the status of wild crocodiles in the Philippines. Of significance was the report that there is a wild population of C. mindorensis in the Liguasan Marsh of southern Mindanao, coexisting with C. porosus. On the basis of this information a research project was initiated to survey and conserve this wild population. The first step consisted of an exchange of information between the Mabuwaya Foundation and the University of Southern Mindanao, involving personnel from each area visiting the other. Planning is now underway to undertake surveys in the Liguasan Marsh. The conservation and taxonomic status of the Apaporiensis Caiman has been identified by the CSG as an issue in urgent need of resolution. This subspecies of Caiman crocodilus was described by Frederico Medem (1981), a cautious and skilled taxonomist expert with crocodilians. Yet the restricted distribution of C. c. apaporiensis to the Apaporis River area in the Amazon River Basin of Colombia has so far complicated efforts to assess its conservation and taxonomic status and needs. For the CSG this is a particular concern - if its taxonomic status is confirmed it is likely to be “Critically Endangered”. 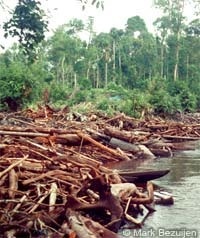 The Apaporis River area is frequented by guerillas and is thus dangerous for researchers to visit. In view of these security difficulties, it has not been possible for CSG researchers to access the area at this stage. 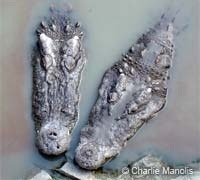 Conservation of the remaining wild populations of Siamese crocodile in Cambodia and Indonesia (Kalimantan) is considered a high priority for the CSG. The species is virtually extinct in the wild in Thailand, although recent surveys (in 2004) indicated that the total wild population may consist of a few individuals in 5 protected areas. Reintroduction of captive-bred juveniles was carried out in 2005 and 2006 in Pang Sida National Park in eastern Thailand (UNESCO World Heritage Area). Apart from the successful reintroduction of C. siamensis into Cat Tien National Park between 2000 and 2003, the species probably does not exist elsewhere in the wild in Vietnam. There are many thousands of C. siamensis on farms in Thailand, Vietnam and Cambodia, and there are reports of illegal trade of the species between these countries and China. This is of particular significance for the wild population in Cambodia, where demand for stocking crocodile farms has been implicated in the decline of the species. The Cardamom Mountains in southwest Cambodia is considered the remaining stronghold for the species, and a research program established by Fauna and Flora International has been operating there for some years. A CSG review of conservation and management in Cambodia (2005) made 31 recommendations designed to assist authorities to improve management of the species there, and a similar review was undertaken for Vietnam in 2008 (see Publications [interlink it]). A Siamese Crocodile workshop (April 2011) brought together stakeholders from throughout the region to discuss efforts to strengthen conservation efforts for the species. The only other wild population of C. siamensis persists in East Kalimantan (Indonesia), in the upper Makaham River. A survey of habitats and interviews with local communities confirmed the presence of the species and that breeding still occurred. The nature of the habitat makes conventional surveying of the population difficult. Population and ecology studies currently being undertaken are revealing important information on this population. 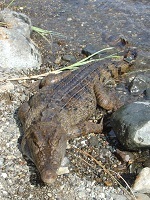 Tomistoma schlegelii is listed as “Endangered” on the IUCN Red List of Threatened Species, and the wild population has been estimated to consist of less than 2500 adults. Distribution data are still relatively poor, making an accurate assessment of status, distribution and population size very difficult. Completed surveys reveal low population densities in fragmented habitats. Populations in many areas have either disappeared or are seriously depleted. Although some habitat lies within protected areas, enforcement for these is limited. Threatening processes such as habitat destruction (logging, cultivation, dams, flood mitigation), drowning in fishing nets, overfishing of food resources, and to a limited extent poaching for skins, threaten the species. The CSG's Tomistoma Task Force (TTF) was established in 2003 to focus the efforts of crocodilian specialists from around the world. TTF’s fund raising and public awareness activities have made possible surveys and related research studies in West and Central Kalimantan. 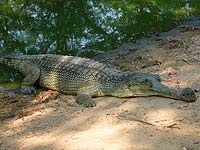 However, more surveys are required to clarify the status of Tomistoma and its natural habitats. Concrete actions are urgently required to reduce risk of extinction and to recover wild populations.